Everyone always makes a huge deal about the first day of school. There are the pictures by the tree and the cool school supplies and the brand new outfits chosen carefully the night before. The kids pop out of bed on the first day of school like they are on springs. You can feel the energy! They are perfectly groomed in record time; they even brush their teeth after breakfast without being reminded....BUT...THAT was yesterday. TODAY was the SECOND day of school. On the second day of school, I have to "coax" them out of bed with a cattle prod. Throats are sore and noses stuffy. Clothes, though still important and often new, are a little less accessorized and certainly less color coordinated. Breakfast is a granola bar, and missing the bus is a serious possiblity. The bloom is off the rose. That is why nobody takes pictures the second day of school...unless you missed taking them on the first day and try to "recreate," but this is hardly ever successful. The happy, anticipatory faces are not to be found. No matter how great the first day might have gone, the second day arrives with a grind and a growl, and that's just the way it is. 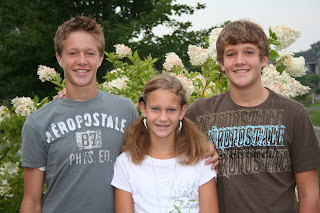 For the Lindquist's, school is off to a GREAT start, despite a few "second day" dramas. All four kids are in brand new schools this year. T has moved over to O. H. Anderson, the 3rd through 5th grade building, and has the same teacher, Mrs. Anderson, whom A had and loved. 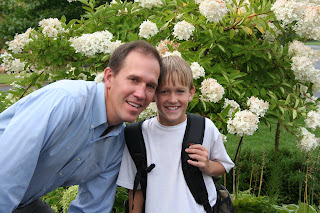 K and Z are back at Mahtomedi Public Schools this fall after four years at Liberty. This is a huge change for them, but yesterday went smoothly, and the many choices for lunch (after years of "bagging it") were much appreciated. (K ate two lunches.) A is beginning his high school career at MHS, and between Honors English and Honors Football (just kidding), he's going to be busy to say the least. (He ate two lunches as well...what d'ya do?) L and I are home digging out the debris that is left by a whirlwind of a summer...I expect that that will take a few days if not weeks, but that too is just the way it is. Best wishes and prayers to you as you leave summer behind and greet the Fall. What a sweet reflection on something we do not often think about. You have a lovely familay, too. Please see today's linkerage at www.BlackWordsWhitePaper.blogspot.com.